TABASCO® brand Chipotle Pepper Sauce --- 2 oz. Pizza dough --- 14 oz. In a small pot, combine onion jam and TABASCO® Chipotle Sauce; warm. Stretch out pizza dough and spread jam across the top. Combine half the cheeses and sprinkle over the jam. 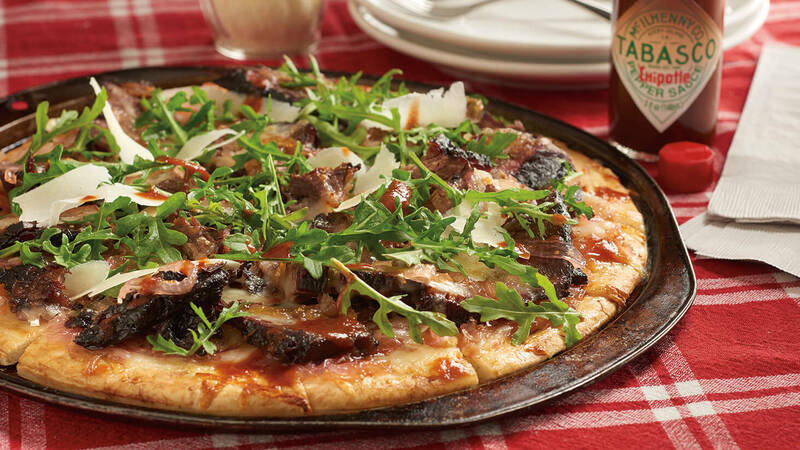 Place brisket burnt ends evenly atop the pizza. Place the remaining fontina cheese atop brisket. Bake in a 375º pizza oven until done. Slice pizza; evenly sprinkle arugula and remaining shaved Parmesan cheese over top.